The entitlements specified in your application’s Code Signing Entitlements file do not match those specified in your provisioning profile.(0xE8008016). I am getting this error. please help me. I have create the provisioning profile and change the bundle id. I have enable the keychain sharing from Target->Capabilities and generate the new .entitlement file. and i have also change the bundle id in that. 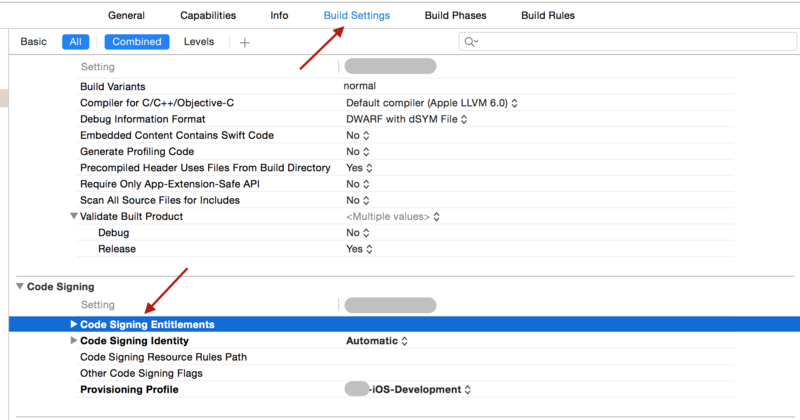 For me in Xcode 5.1, I was getting The entitlements specified in your application’s Code Signing Entitlements file do not match those specified in your provisioning profile. when trying to test the app on my device. Device Development Certificate has to expire Feb 2015. 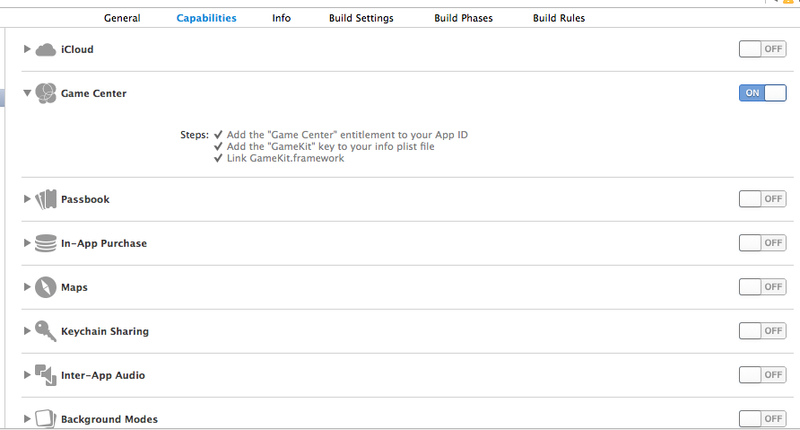 Selected Target->Capabilities, under GameCenter, here I was getting error on GameCenter entitlement as it was not added to project, although first version of application was released via same XCode 5.1 but there were no errors like this before. Below, a button was given with title Fix Issue. When clicked it added the GameCenter entitlement and issue was resolved. For me, there was nothing to do with certificate or bundle identifier. App now runs successfully on the device. In XCode 7.3 I encountered the same question, I 've made the mistake because: Name in (info.plist -->Bundle identifier) is not the same as (target-->build settings -->packaging-->Product bundle identifier). Just make the same, that solved the problem. File > Project Settings... > Shared Project Settings: > Build System --> Selected "Legacy Build System" instead of the default "New Build System (Default)". First of all you should check bundle id, provision profile and certificate with private key (.p12). If it doesn't help. Be sure that the Code Signing Entitlements has correct value or remove it at all. One possible reason for this error is: your annual subscription has been renewed. Once the subscription is renewed, all devices related to the active provision profiles will be detached. The admin must reactivate the list of devices for the new subscribed year. The admin must delete last year provision profiles. (all are useless). The admin must regenerate new provision profiles for the new year with the list of devices of his choice. After this, rebuild project with Xcode and the error will disappear. Had this issue. My main app and extension belonged to the same app group id correctly, but there was also one more app ID not in my project that shared said app group id. I had to remove this last app ID's association with the app group. I was having same issue on Xcode 7.3 with iPad Air 2 with iOS 9.3.4! Then I tried many options. Finally I deleted profile from device, changed bundle identifier in project settings, and whola! It worked for me. P.S. I was using free provision profile using free Apple ID. for me, just press cmd+, then go to account ,chose your developer account refresh(XCODE6) OR download all (XCODE7) will fix. Check your bundle identifier and your profiles. If you have a profile for a specific bundle identifier and no team ones and your bundle identifier does not match it will give you that error. 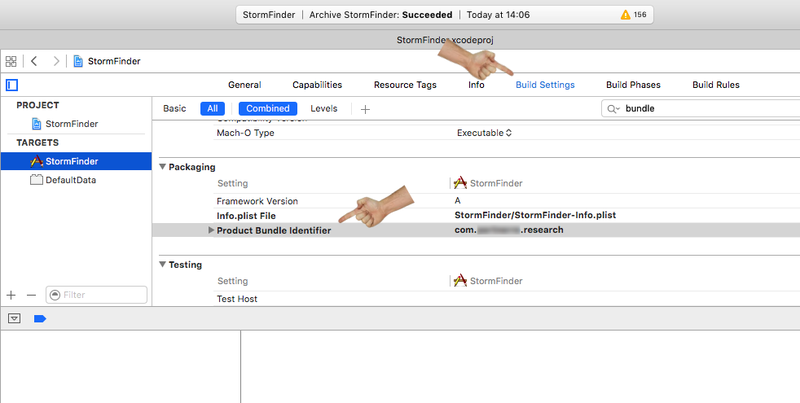 Bundle identifier is in General section of your project properties and the profiles you can check in build settings. In my case, I had a duplicate Provisioning Profile with the same name. This was accidentally created when I added an share extension to my project, stash all of those changes with git, and created a new share extension with the same name (com.companyname.project.share-extension-name). Deleting the Provisioning Profile in the developer member center (developer.apple.com) fixed this for me. Had this issue with a cordova / ionic3 app, was caused by forking a main app and not selected again the legacy system in project settings. I selected legacy and the entitlements bs went away. Had the same problem, nothing was helping, but I looked in Info.plist and found out that bundle ID was changed to other name (I don't know how it happened), so when I changed it to correct one everything was fine again. In my case, the app main Target's Team was different from Tests' Target Team. Changing the Tests' Team to the same Team as main Target's solves the issue. Not the answer you're looking for? Browse other questions tagged ios iphone xcode or ask your own question. 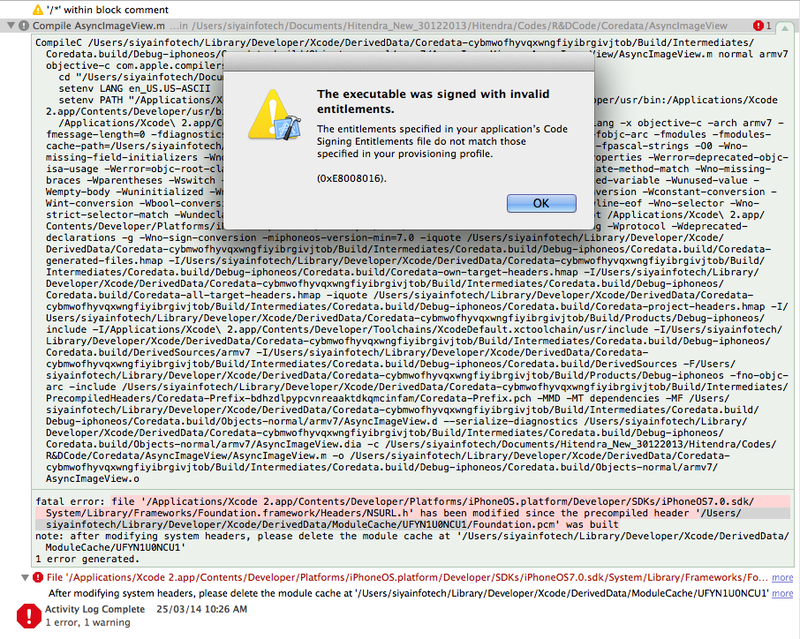 Code Signing Entitlements file do not match those specified in your provisioning profile.